The product's main purpose is to provide a connection to your telephone system to call and to be notified about calls. pvCTI integrates seamlessly into SugarCRM. 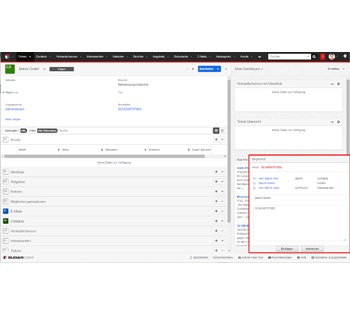 It generates a call once you click any number in SugarCRM and even runs in the background, providing browser notifications. Also, pvCTI is connected to the search api and incoming calls can be assigned to a selection of found records. 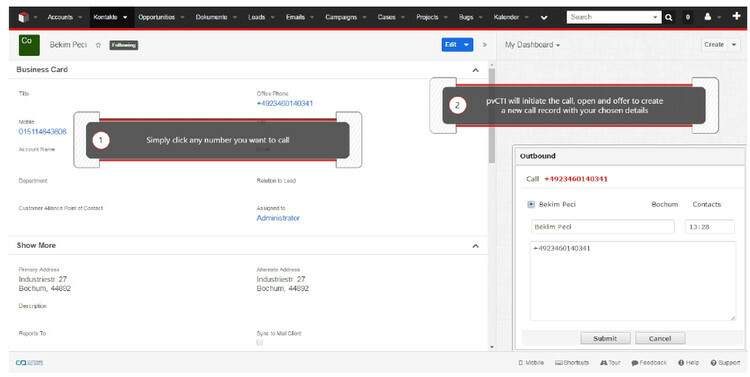 The solution is able to generate calls, create the corresponding records in SugarCRM and notify you about incoming calls for your own number or any ring group which you are part of. pvCTI integrates seamlessly into SugarCRM. It generates a phone call once you click any number in SugarCRM and even runs in the background, providing browser notifications. Also, pvCTI is connected to the search api and incoming calls can be assigned to a selection of found records. The solution is able to generate calls, create the corresponding records in SugarCRM and notify you about incoming calls for your own number or any ring group which you are part of. pvCtI works with all telefon systems that are (J)Tapi capable - e.g. Asterisk, Cisco, Avaya, OpenScape, (free)PBX. Even different types of telephone systems (PBX) can be connected to one instance of the pvCTI Observer. pvCTI doesn't compromise your security: Clients do not have to install anything to their computers. SugarCRM is connected to the telephone system via our Observer which can handle even more then one telephone system in parallel. pvCTI is developed as movable overlay - it can be placed where ever you want and you will not lose any information behind a window. 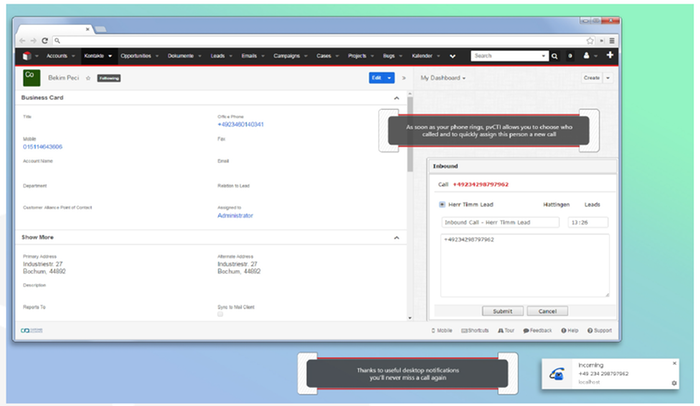 Even when your SugarCRM window is minimized a desktop browser notification will inform you.